A marriage requires a lot of investment both in terms of marriage arrangements and for starting life together in a new home. One important investment required for a home is furniture. Furniture are the ones which turn a house into home making it lively as possible. To choose a right furniture for the home requires a tremendous amount of time researching and selecting within the desired budget. The brand, the type of woods, the design, the finishing, the looks, the colour and the price all play an important part to select furniture for a home. I remember going from one store to another looking out for new and trendy furniture with my parents during my marriage times. It was a kind of exhausting when there was less variety of furniture to choose from especially after travelling one shop to another for hours. Finally, we decided to hire a well-known carpenter through a relative who was capable of bringing well-designed furniture to our taste as well as near our budget. But now if I plan to buy a furniture, I have to think twice as finding a good carpenter is not that easy in every place. And being used to online shopping I started eyeing for furniture that is in good looks and at good rates. Moreover, things have changed now as varieties of lifestyle furniture including vintage and contemporary models are sold at an affordable rate online itself. It saves the exhaustion from going one store to another in order to find a piece that fits ones taste. There might be a furniture which is priced a little lower in some other store running promotions. The shops near you do not offer much variety in terms of colour or design. Or you feel online shopping is just for you because of the comfortable and convenient way of selecting your desired furniture. But before investing in a furniture, it is important to know where exactly you buy your furniture. With online retail blooms throughout the Internet, one can find furniture in almost all online shops sold either by the dealers, distributors, any middleman or the brand itself. 1. Select a furniture that goes on par with your home surroundings, including the length and breadth of the home. Always collect or check the approximate measurement details of the product when you search for a furniture online. It is better to go with light and neutral tones to match with any other items at home or with items you might buy. 2. Next, select an online store that is popular with professional look and has enough security protection in order to protect your transaction details. An e-shop that has also a brick and mortar location is a good deal as it will eliminate shipping costs as some websites do ship them to your nearest store after you have ordered online. Also, you have a choice of experiencing the furniture in-store and them shop at your own convenience from online. 3. After selecting the store, read its FAQ’s on shipping policy, warranty and return policy. While some online stores offer free shipping, some don’t. It is always good to calculate the shipping cost according to your place of residence and keep an eye for the warranty duration. Quality websites offer good warranty for their sold products. Example: Durian furniture #JustAClickAway offers “free delivery” all over India, helps assemble the furniture and also gives a warranty duration for about 5 years. 4. 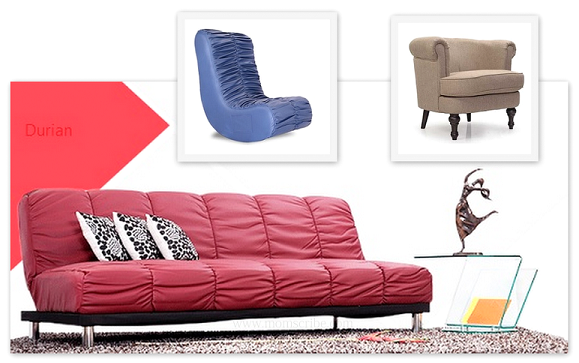 Then, select your desired furniture according to your taste and preference. This should be in line with the measurement that is actually needed for your home. Check for images to give you an impression of looking at the whole product. Most websites gives front views, side views and inside views of the furnitures like cupboards, drawers, bed, etc. 5. Next, always read the product description as it gives you more detail of the actual product you see in the image. As most woods are being transported from one location to another with slight to moderate different weather, it is important to note for one raw material “Veneer” which helps furniture to retain its quality and stands the test of time. Veneers are nothing but thin slices of wood that are glued onto core panels of wood. Almost all furniture pieces that use veneers have solid components and also allow space for creating patterns or decoration which was not possible with solid planks of wood. Durian furniture that I am looking into now uses raw material such as Ply, Veneer, Laminate and Blockboard. 6. Always, read customer reviews if given. 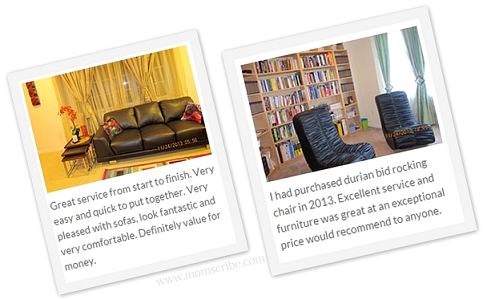 This will give you what actually the buyers felt when they brought a similar furniture. It will give a head up for proceeding to the check-out without hesitation. 7. Finally, the hassle free payment with enough protection will make the whole shopping worthwhile. My pick Durian offers different modes of payment through Debit cards, Visa, MasterCard, American Express Credit Cards, Net banking (up to 32 banks) and Cash On Delivery (COD) options up to the value of Rs.50000. 8. Last but not least, always save the records of all your transaction starting from product price, description details, terms of sale and most importantly your online receipt. This will help in case of returns, refunds, disputes or warranty. Hope this helps for anyone who wishes to shop for furniture online. Do you have any more pro tips to share? Thanks for the wonderful advice. Sometime a not so good product in real will look so good online thru clever photography. We should be aware of that. Thats a great review, As SG told we should be aware of the clever photography while browsing through and buying products. I believe that furniture like sofa/chairs should be bought only after physically examining them,sitting on them and feeling the comfort.The look and the comfort do not go together always.A good guideline for purchase of furniture.